The Classic By-Pass features our exclusive "Free Flow" sill track with floating nylon guides attached to the door panels, which allows for both positive door traction, and easy cleaning. 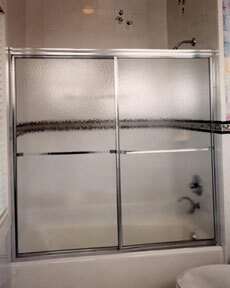 The Classic By-Pass is available in Silver and Gold finishes with your choice of obscure or clear glass panels. Offered in various heights to accommodate tubs, acrylic and fiberglass stalls, tall tiled and more most standard openings, and custom sizes and configurations are available by special order.